I was born in Hertfordshire in 1941 and lived at Great Amwell a small village near Ware and though in the country we were only a few miles from London and we had an Anti aircraft battery at the end of the road. I believe some of my first drawings were at about 4 to 6 years old, pictures of soldiers shooting other soldiers, all along the bottom edge of very precious sheets of paper. Paper being so scarce due to the war I was then encouraged to use the rest of the sheet as well, so I turned the paper round and round, drawing battle scenes along every edge. Only to be told there was a big blank space in the middle, before I thought of drawing the soldiers shooting up at planes with swastikas on them. I then added English planes with RAF roundels and little pin men airmen parachuting to earth and thus used up the whole valuable sheet. During the worst war years I actually had netting over my bed as a child in order to catch the ceiling should it come down .Whilst mother and I faced the Luftwaffe, not far from London, father was in RAF in India, where according to his diaries it seems that he spent most of the time in the cinema. After leaving school I had a few years working for a High Street bank where I am afraid my sense of humour and perhaps their lack of one, made the prospect of another forty years plus of service ahead of me fill me with terror. Had I managed to stick it I would probably now be an early retired small branch manager with an index linked pension and a house that was bought with a staff housing loan. Not so clever? Always fascinated by the old and antique and the antique dealing crowd from the shops on Holywell Hill in St Albans and their conviviality at The White Hart Inn after work, I ran from the safe and secure arms of banking in to The London Silver Vaults to spend a few years selling antique silver to the wealthy, famous and infamous from all corners of the world. Hankering to be my own boss I later had two antique shops of my own.The first in Harpenden and then another, after I married Susan my wife, when we moved to Swanage on The Isle of Purbeck. 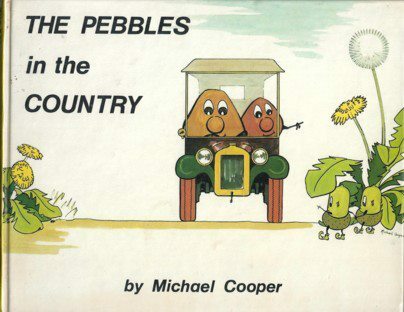 One day on the beach playing with my daughter Joanna I was drawing cha racters in the wet sand, Magic Roundabout’s Dougal and Zebedee etc., when we created the Pebbles, which was the start of a series of childrens books. The car shown in this book was based on an old 1929 Austin Chummy Reg No HX1033 that I bought when I was twenty years old for £30 and later sold for £100. I hate to think what it would be worth now. was an e xperience that stood me in good stead though when it came to painting the farming scenes that I now specialize in. This experience also gave birth to another book, a small pocket book in the Discovering Series called Discovering Farmhouse Cheese.I sometimes see copies of it or The Pebble books cropping up on Ebay from time to time. The cheese making tasks on the farm finished at lunch time and I started painting in the afternoons to add to my farm workers wage somehow. 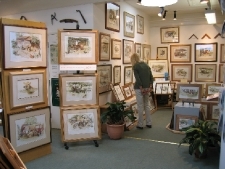 I was soon painting pictures of the local farmhouses for their owners and was enlisted by Wookey Hole to create a range of products for their paper mills shop. Later following the family’s involvement in a major car accident I opened my first studio gallery in 1984 up many flights of stairs in the attic room at the top of Crispin Hall, an old Victorian workers institute building at Street in Somerset. Having received no formal art training after leaving school it is very pleasing to think that my farming pictures, paintings and limited edition prints have been purchased by collectors throughout the world who have visited my studio. 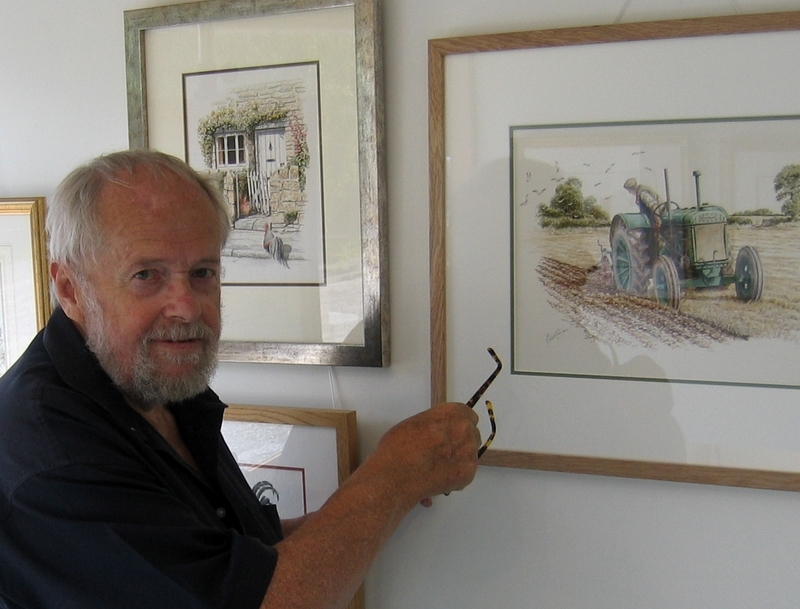 A few years later, after an exhibition at Harrods my painting started to attract attention and I discovered a demand for my highly detailed rural watercolours and studies of farming life. By recording the rural scene I hope I have captured a way of life that is disappearing so fast before it has gone forever. 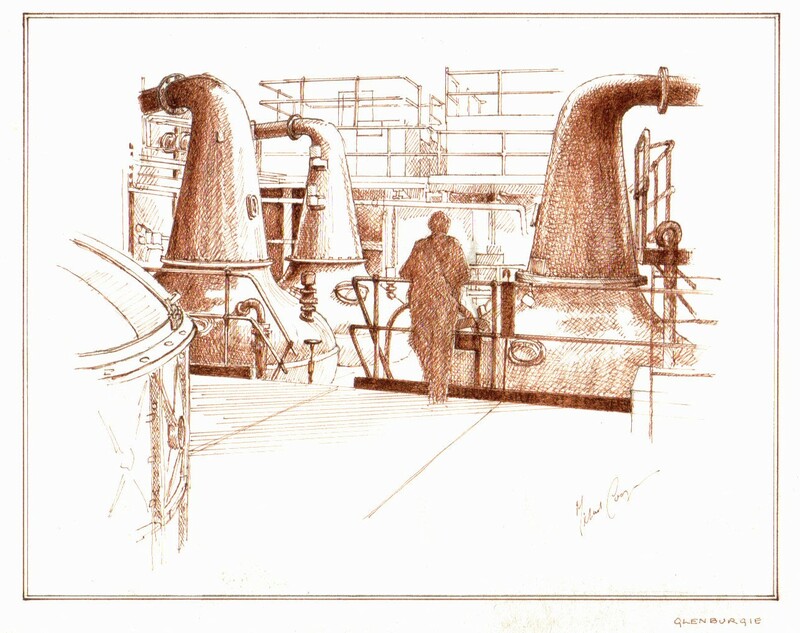 In 1996 following a two-year commission for Allied Distillers painting all their whisky distilleries from Glasgow to the Orkneys I moved my studio gallery to Clarks Village the first purpose built outlet shopping centre in the UK. You would be surprised how many of my friends offered to come and hold my brushes whilst I worked on this commission! It was during this time that I discovered Marcus Govier’s cider orchard at the foot of Glastonbury Tor and went on to paint my Cider Orchard Collection of about twenty paintings over a two year period recording day to day life at Marcus’ place. 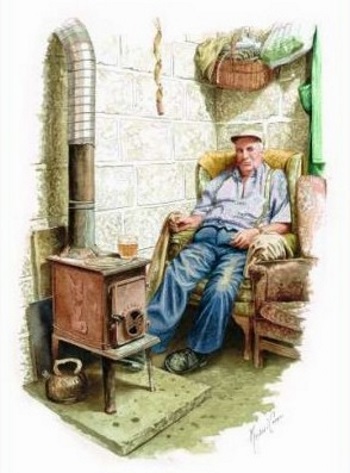 By the way I think I can guarantee that this picture of Marcus relaxing in his shed with his cider is the only painting in the world that includes a Safeway carrier bag and a Fly Paper in it. I have always liked to think that as an artist I had my feet on the ground so to speak. Most of the old famous artists were tradesmen artists, Turner,Constable and so on were not propped up by any grants from the Arts Council but relied on their clients for support. 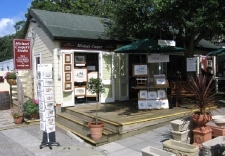 So after years of being firstly up forty two steps of the stairs at Crispin Hall and then above Marks and Spencer at Clarks Village it was a treat when they moved my studio into a wooden barn like building on the ground floor and make my work more accessible to the public. In both these studios I was assisted by my son Benjamin for some years who dealt with selling my cards and prints wholesale and who organised our displays at the shows. We used to have quite a large stand at The Royal Bath and West Show and displays at The Great Dorset Steam Fair and New Forest Show as well as The International Gift Fair at the NEC. Knowing that I was planning retirement Ben needing to be with a growing concern rather than with his father who was winding down, went on to become a sales executive for Daler Rowney the artist materials company. 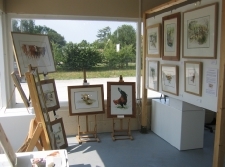 July /August 2013 – I had the featured exhibition at the Somerset Crafts Gallery at the Avalon Marshes Centre and was really touched to see how far some people came to see my paintings and make it a successful show, thank you. 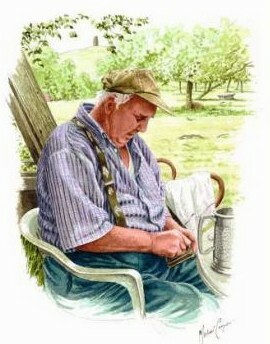 Retirement, not quite and not yet? In 2011 I moved with my wife Susan to Ashcott, a small village at the end of the Polden Hills on the edge of the Somerset Levels where we were joined later by Ella our cat. She had been featured twice in our local paper as a little waif that they were having trouble to find a home for. 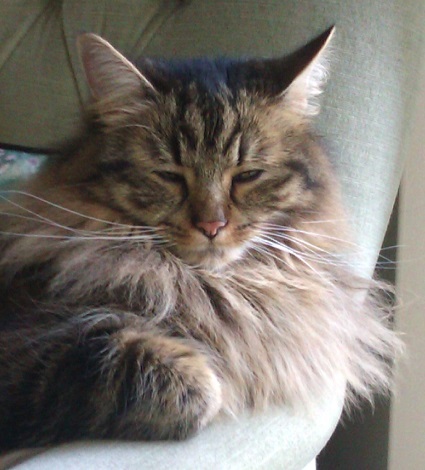 So it is really The Central Somerset Gazettes fault that we now have a home full of cats fur. And I think Susan has had enough to put up with being married to an artist without have an ultra fussy eater of a cat to worry about as well. On moving to Ashcott I joined Somerset Crafts a cooperative of twenty or so artists and craftsmen who display their wares at their gallery at The Avalon Marshes Centre near Westhay next to the famous nature reserves at Shapwick Heath.We each put in two days a month stewarding at the gallery, so I can be found there every other Thursday. Unfortunately my eyesight after years of demanding work prevents me from painting the extremely detailed pictures that I was best known for. I continue to sell my prints and Salmons the oldest calendar publishers in the country have published my work for some years making it available as calendars, cards and even illustrating their little recipe books.